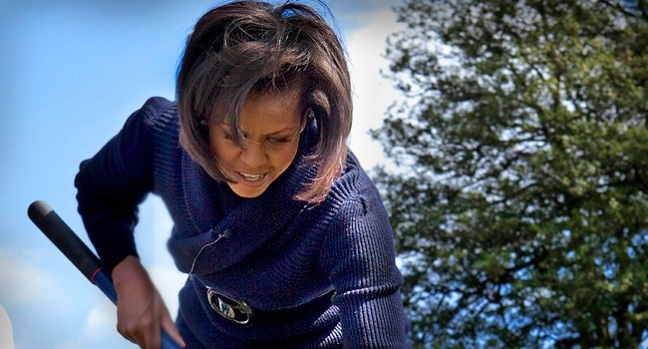 First lady Michelle Obama and friends mind the White House garden. 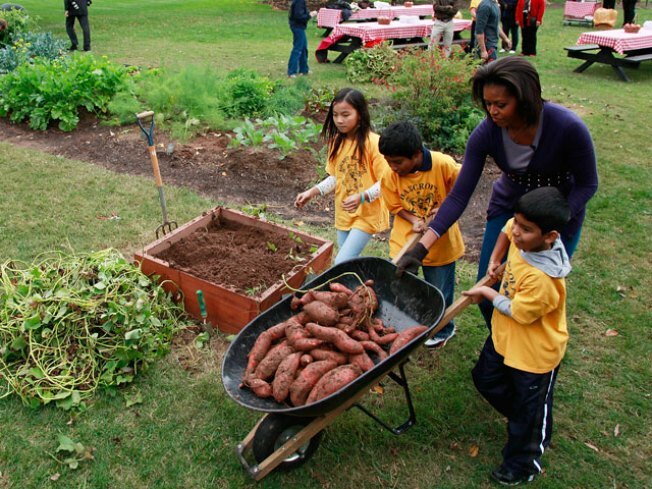 In case you were wondering, the White House garden created by first lady Michelle Obama and a band of merry D.C. students has produced more than 1,000 pounds of produce this year. Yeah, we have trouble believing that too, but if the White House Food Initiative Coordinator says it, it must be true. But just because freezing temperatures have hit the District, that doesn't mean the growing season has come to an end. Just the opposite, the green thumbs are planting even more veggies for the winter months. Spinach, lettuce, carrots, mustard greens, chard and cabbage are already in the ground, and a few more varieties will be added in the next couple weeks. White House assistant chef Sam Kass said winter spinach is extra sweet because it produces extra sugar in the winter to protect itself from frost. "It tastes almost like candy," Kass said. So how is this all possible? Kass said they've extended the growing season by using a hoop house, which is basically an inexpensive cover. "A hoop house simply amounts to a series of metal bars set in a row over one of the beds, and a fabric or plastic pulled tight around the bars," Kass said on the White House blog. "As the sun warms the garden during the day, the fabric traps the heat in, keeping the plants from freezing overnight. Although there are many kinds of plants that aren’t able to grow even in the hoop houses, we are thrilled to have so many delicious things growing at this very moment!" Another insider's secret from Kass: in the parts of the garden that aren't being planted with vegetables, the urban farmers are planting rye. "This is a technique that farmers use to help re-balance their soil and, most importantly, prevent erosion of top soil during the harsh winter," Kass wrote. "This is an incredibly important technique that all growers can utilize. Topsoil is one of our most valuable commodities, and we are working hard to protect it." So there you go. Get yourself a hoop house and some rye, and you're well on your way to a half a ton of food. But just don't plant any of those stinkin' beets, right Chief?